» Can Derek Jeter Catch Pete Rose? 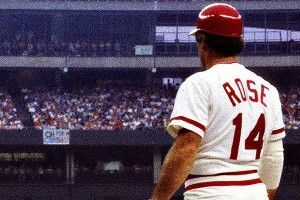 Pete Rose is the all-time MLB hits leader, with 4,256 to his name over a long and storied career. He’s one of only two players to have surpassed the 4,000-hit mark — Ty Cobb is the other — and he played for 24 seasons. Derek Jeter is the 37-year-old Yankees captain who reached the 3,000-hit plateau last season and appears, for the time being, to be sustaining a strong pace well into the twilight of his career. So far in his 18th season, Jeter is red-hot, batting .416 with lots of singles. He’s a shoo-in for the Hall of Fame, and right now Vatican bookmakers have him at 3-1 odds for achieving sainthood. On the face of it, the idea of Jeter catching Rose seems absurd. How can a 37-year-old have 1,000 hits left in him? Rose had several advantages Jeter does not, starting with the fact that he managed himself in his last three seasons with the Reds, padding his career stats with 194 hits while his batting average fell all the way to .219. It’s hard to imagine a results-oriented club like the Yankees tolerating that sort of decline with Jeter, and it’s even harder to imagine Jeter signing with a different, bottom-of-the-barrel club just to pursue the record. There are other reasons to scoff at the notion. Rose was blessed with mostly good health that we can’t assume for Jeter as he approaches 40. Rose played first base, a position with less stress than shortstop. (Although this could also work to Jeter’s advantage — diminished production and negligible power is more acceptable at a weaker hitting position like short, whereas it would be a huge disadvantage at first or third.) And, of course, Jeter will not likely stay in the game until age 45 like Rose. But just for fun, let’s take a look at the numbers and see where Jeter stands in the chase for Rose’s record. We’ll assume good health and, for now, steady production. Age-wise, at this point, we can see that Rose, who hit Jeter’s day/age combination in the offseason after 1978, is slightly ahead of Jeter. Considering everything that has to go right for the Yankees captain to catch Rose, it’s a bad sign that he’s behind at all. That makes things a bit more interesting. It’s damn close, but Jeter gets base hits at a slightly higher rate than Rose. The reason Rose has more hits at the same age is because he’s been slightly more healthy over his career and accumulated more plate appearances. But using the current hit rate of each (again, assuming Jeter doesn’t go through an age-related decline), Jeter will gradually catch up. The man got old. That drop gives Jeter a window. Because we’re being super theoretical here, let’s give Jeter his current hit rate and figure out how long it would take to overtake Rose’s record. At this point in his career, Jeter is averaging 4.6 plate appearances per game. That means he’ll need 890 games to catch Pete Rose, or almost exactly five and a half seasons. In a year with perfect health, Jeter plays about 155 games per season. Using that math, he would break Rose’s record in his 132nd game of the season in 2017. It’s impossible to put an exact date on it, but it would be sometime in early September, and Jeter would be about 43 years and two months old. As a Yankees fan, I’m currently having fantasies about Jeter breaking the record in Yankee Stadium. Excuse me for a second while I have a rare medical event called a “happy seizure” on the floor. Now then, since I think I’ve covered the pessimistic territory — he’ll decline with age, he’ll get hurt, he won’t stick around until age 43, much less 45, he won’t get to manage himself, he won’t leave the Yankees to pursue the record with the Royals — I feel I’ve earned the right to end on an optimistic note. So far this season, Jeter has 32 hits in 83 plate appearances, for a hit rate of .386. Please turn the other way while I ignore the issue of sample size and put on my gigantic Yankees goggles: Holy hell, guys, he’s getting better! Can Derek Jeter Catch Pete Rose?